Willis Plaza today showcased his class as he fired twice for Churchill Brothers in their 2-1 win against Indian Arrows today. The game was being played at the Tilak Maidan in Goa. Plaza, who has also adjudged the Hero of the Match, scored his first in the 22nd minute off a header while his second came in the 45th minute that gave Churchill Brothers the lead after Deepak Tangri’s eaqualiser for Indian Arrows in the 38th minute. With this win, Churchill Brothers are now placed second in the I-League points table with 28 points, two short of league toppers Chennai City FC. Hosts Churchill Brothers pressed hard right from the first minute, but the young Indian Arrows defenders ensured they stand tall to their reputation. Willis Plaza in combination with Dawda Ceesay and Anthony Wolfe kept pressing hard on the young Arrows from both sides but full credit to the visitors, their defenders stood strong to deny Churchill Brothers any clear opportunity to score. On the other hand, the Indian Arrows did make some interesting moves, breaching the Churchill Brothers defence line as well at times, but a lack of a creative finish and experience kept the youngsters away from scoring. 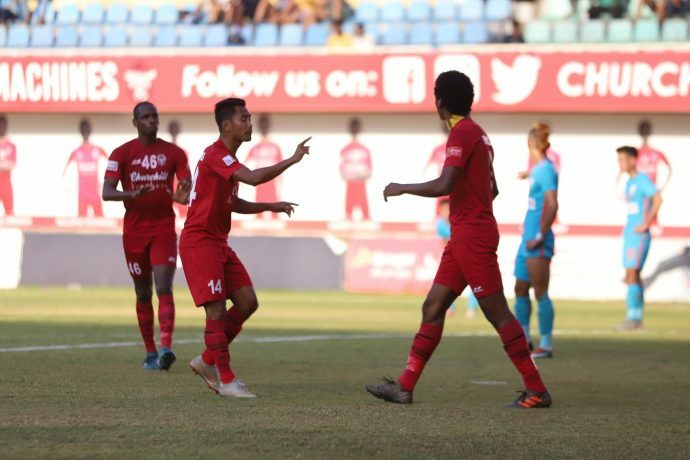 Churchill Brothers who did not stop with their attacks were soon rewarded when an inch-perfect pass from Dawda Ceesay was beautifully headed inside the goal by Willis Plaza in the 22nd minute, stunning the Indian Arrows goalkeeper Prabhsukhan Gill. This took Churchill Brothers 1-0 up in the game. Churchill Brothers thereafter kept pressing hard to double their lead but the Arrows defenders were more attentive now denying the hosts any chance to double their lead. However, the Indian Arrows attacking front kept on with their attacks in short intervals trying hard to find an equalizer. The Indian Arrows were soon rewarded with an equaliser in the 38th minute when Deepak Tangri headed the ball into the back of the net from an Abhijit Sarkar corner kick. This equaliser got the Indian Arrows pressing harder, this time in search of taking the lead but their efforts did not yield any results. Churchill Brothers, who were now mostly attacking on the counter, saw their lead in the 45th minute when Willis Plaza snatched his second goal showcasing individual brilliance, beating the Arrows defenders and finally keeper Prabhsukan Gill. Churchill Brothers finished the first half with a 2-1 lead over Indian Arrows. The second half got underway with the home side pressing hard to keep the pressure on their young visitors. However, a sturdy defence line on both sides ensured that either of the teams did not get any clear chance to add another goal to the scoreline. The game, which was a little physical in the second half, saw Churchill Brothers pressing really hard to score. Anthony Wolfe, along with Willis Plaza were again attacking from both flanks but were unable to trouble the Indian Arrows defenders. Indian Arrows tried making the most of the set-pieces that they were awarded, but couldn’t find that equaliser that they were looking for. Indian Arrows’ efforts were nearly rewarded when a penalty was awarded to them in the 84th minute. Unfortunately, Sanjeev Stalin, who took the shot, could not convert it thanks to an outstanding save from Churchill Brothers goalkeeper James Kithan. This probably was the closest that the Indian Arrows got to scoring the equaliser in the second half. The game thereafter saw numerous attacking moves from both sides but the scoreline remained unchanged at 2-1 to Churchill Brothers’s favour.